The treatment is particularly effective against some of the deadliest types of the disease, including lung and skin cancer, and has also been effective in trials against kidney, bladder and head and neck cancers, according to Britain’s Daily Mail. Although our immune system fights infections and cancer naturally, some tumours are able to develop protective shields, rendering the body’s immune system, chemotherapy and other drugs ineffective. Immunotherapy nevertheless breaks down these shields and teaches the body how to attack tumours. The British-led research suggests that a combination of two drugs can shrink tumours in nearly 60 percent of people with advanced melanoma. The BBC reports that an international trial on 945 patients found treatment with ipilimumab and nivolumab stopped the cancer advancing for nearly a year in 58 percent of cases. This was compared with 19 percent of cases for ipilimumab alone, with tumours stable or shrinking for an average of just ten weeks. The findings were presented at the American Society of Clinical Oncology Conference in Chicago, and published in the New England Journal of Medicine. The Guardian reports that Professor Roy Herbst, chief of medical oncology at Yale Cancer Centre in the US, said the findings are “spectacular” and the treatment could potentially replace chemotherapy as the standard cancer treatment within five years. “I think we are seeing a paradigm shift in the way oncology is being treated,” he said. 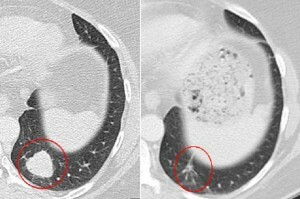 Dr James Larkin, a consultant at the Royal Marsden Hospital and one of the UK’s lead investigators, told BBC News: “By giving these drugs together you are effectively taking two brakes off the immune system rather than one so the immune system is able to recognisetumours it wasn’t previously recognising and react to that and destroy them. Chemotherapy was not routinely used on cancer patients until the 1960s. It usually causes extreme tiredness, sickness and hair loss and can make patients susceptible to infection. The side effects of immunotherapy are reportedly less severe than for chemotherapy, but include rashes, sickness and tiredness.